Is The Yoga Class Killing Yoga? The Yoga Class: Is it Good For Yoga? I’m not merely juggling semantics here. I’m just wondering if you’re curious how the yoga class has, for so many, become synonymous with yoga itself. … and if that’s a good thing or not? With tens of thousands of folks gathering in cities and towns around the world every day to bend and stretch and breathe like a yogi, one would think that this ritual has been around for centuries. The concept of a yoga class, at least the typical idea of it that dominates the yoga landscape today, is actually barely even a few decades old. Over a relatively short period of time, yoga has gone from a reverential science for profound, personal transformation, to a slick and polished item to be packaged for consumption by an ever-growing yoga market (go easy on the hate mail, please :O)). Tracing the evolution of yoga from ancient to modern times is a complex affair. I sure can’t do it in this one little article. Suffice to say that yoga has undergone numerous changes and alterations over the course of its lengthy history to arrive where it is today, none perhaps so impacting as the massive changes it has gone through in the most recent decade or two alone. But the question is, how, or more importantly, why did this happen? She explains that it all started early on in the 21st century, when the first significant wave of Indian Gurus began to touch upon Western shores. One thing that we’ve always identified strongly with here in the West is our body and the whole range of sensations associated with it … and it didn’t take long for some yoga teachers to start to tap into the wants and desires of their growing market of yoga students. Yoga, which is a science designed to help us to gain control over our unruly desires and cravings, now often seems to be catering to them instead. So much so, that the majority (not all, but yes, definitely the majority!) of people who “do yoga” today see it as little more than an exotic form of physical fitness, a great way to decrease stress, flatten those abs and tone up that sagging backside! I hear the phrase “great yoga workout” way too much. Yes, something is definitely wrong with this picture. Yoga is Quickly Fading From the Modern Yoga Scene. Ironically, recent gurus and yoga masters realized that the less yoga they taught, the more students the got! 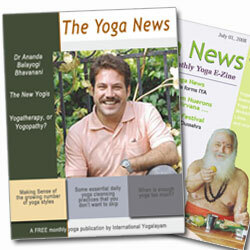 That ethos seems to now been etched deeply into the psyche of the modern yoga movement. Now you might be quick to raise the question of how such enlightened, sincere beings got so easily steered off course? Honestly, I don’t know. I do suppose, however, that it wasn’t as cut and dry as gurus getting simply caught up with something so base as greed. These past several decades were times of huge shifts in human relations and social values and, well, yogis are still people too. But it is disconcerting to observe that this wayward course of yoga that they initiated has become the direction that most follow today. Voices of reason, though they are there, can often only faintly be heard behind the noisy foreground of a huge number of well-meaning, but under-educated yoga enthusiasts … eager teachers who are merely following suite and steaming forward into the multi-million dollar yoga marketplace, blending yoga with a hodgepodge of new-age ideas that may not fit so closely with the philosophy and practice of yoga as they might seem on the surface. Do we blame the “yoga class” itself for wreaking this havoc on yoga, or did the demise of the traditional system of yoga in its early days here in the West merely pave the way for the development of the modern, watered-down, anything goes body-conscious yoga class?